CLARK PAMPANGA, 26 November 2017 – AirAsia is flying to brand new destinations from and to Clark Airport in Pampanga starting next year. The world’s best low cost carrier for nine consecutive years will begin to fly from Clark to Palawan, Iloilo, and Tacloban starting January 26, 2018 with introductory fares now on sale from as low as P990 only. AirAsia Philippines CEO Captain Dexter Comendador said, “We feel strongly about supporting the growth and development of cities outside Metro Manila by providing more options and added convenience for travellers to fly to their desired destinations without going to the main airport in Manila. 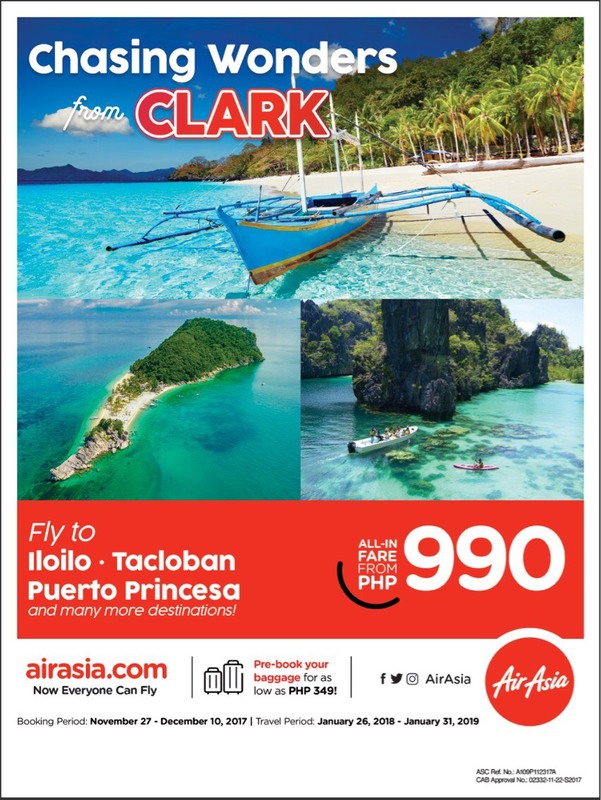 AirAsia’s newest flights from Clark bring brighter, bigger, and better opportunities for Northern and Central Luzon"
To celebrate, AirAsia is offering promo fares from as low as P990, all-in, and up for grabs now until December 10, 2017 atwww.airasia.com for travel period between January 26, 2018 to January 31, 2019. Clark - Puerto Princesa and Clark – Iloilo routes will operate three times a week or every Tuesday, Thursday, and Saturday while Clark – Tacloban route is every Monday, Wednesday, Friday and Sunday. AirAsia also flies to Davao, Kalibo, and Caticlan from Clark International Airport using Airbus 320s that can accommodate up to 180 passengers. Aside from Clark, AirAsia also offers flights to Iloilo, Tacloban, and Puerto Princesa from the airline’s hub in Manila, Cebu, and Davao.